Before you can start budgeting your money, you have to make sure you know exactly how much of it you have today. It's critical that your transaction list in MoneyWell matches what you see on your bank statement or website. Reconciling is simply a way to confirm that the transactions in MoneyWell are identical to ones in your account. If you follow these steps, your balances in MoneyWell and on your statement should match and that statement is reconciled. Let's dig a bit deeper into the process to see how MoneyWell helps you do this quickly. The Reconcile view in MoneyWell is designed to help you quickly discover differences between your transaction list and your bank register. At the top is the header, which gives you feedback about which account you have selected, the status of the statement, and the sum of the listed or selected transactions. Below the header is the reconcile panel. This allows you to select a statement and enter the starting and ending values for that statement. The dates you enter on the statement combined with the account you have selected drive which transactions are shown in the main list below the reconcile panel. You also have a MoneyWell filter bar to help you search and filter the list and find exactly what you need. Before you begin to reconcile, you need to select an account from the context list to the left. You can't reconcile more than one account at a time or use smart filters during this process. After you have an account selected, you need to add a statement. If this is the first time you've reconciled this account, MoneyWell will already have added one for you. If you have other statements reconciled already, then click New Statement below the dates to add a new statement. Once you have a statement, you're ready to get down to matching it to your bank statement. You might be working from a paper statement, a PDF file downloaded from your bank's website, or directly from a statement view on the bank website. No matter what you are using, you need to find two dates and two amounts: Starting Date, Ending Date, Starting Balance, and Ending Balance. These are usually pretty obvious on the statement. Enter both the start and end dates into MoneyWell and you'll notice that the list of transactions adjusts to fit those dates. There also will be other transactions shown from outside those dates if they have not been reconciled in the past or in the future. Next enter the starting and ending balances from the statement. Once these two numbers are in place, MoneyWell will show you an "Unreconciled Balance" below the ending balance—the goal is to get this to zero. Between the starting and ending balances are three other numbers that will help you narrow down where your mistakes might be during the reconcile process. Most statements break out at least the deposits and withdrawals and many also break out checks. If you have reconciled your transactions and one of these totals doesn't match your statement, you can review that specific set of transactions to find the error. Lastly, go down your transaction list and check off any transaction that appears on your bank statement using the spacebar or by clicking the checkbox on the right of each line item. When you have all them matched up, your statement should show as reconciled. 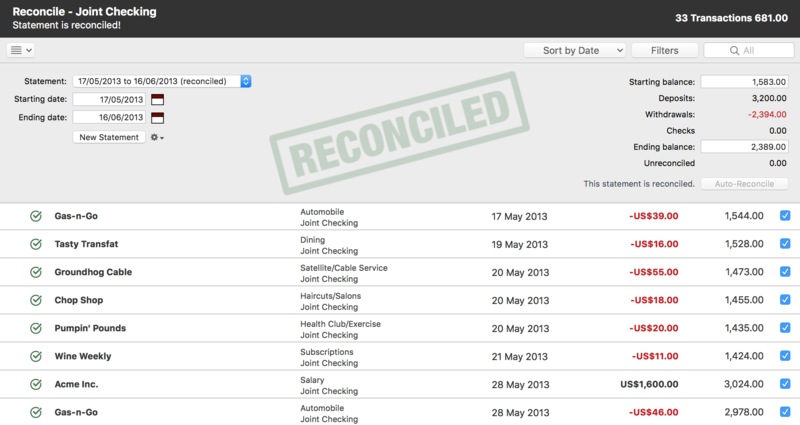 One very cool feature of MoneyWell is Auto-Reconcile. This button saves you steps by analyzing what is needed to complete a reconciliation and giving you a single click way to do it. If you see a blue-tinted message next to this button and it is enabled, you can click it and MoneyWell will take you to the next step in the reconcile process. You can also undo an auto-reconcile action so there's never any harm in trying it. Missing ending balance - If your ending balance is blank, auto-reconcile will pick the running balance on the end date and use that to fill it in. Checking open transactions to reconcile - If marking the items in your transaction list will reconcile this statement, then you can click auto-reconcile and save yourself the time of marking each transaction individually. This is very useful if you use direct download or import your transactions. Starting balance should be zero - For your first statement, you should include your transaction holding your initial account balance, which means, your starting balance should be zero. MoneyWell knows this and can fix it for you. Liability accounts have negative balances - It's rare to have a positive balance on a loan or credit card, but you may have accidentally entered those as positives. MoneyWell can fix that and make them negative. Dates overlap or ending date is before starting - When you add a new statement, its start date should be the day after the end date of the previous statement. Also, the end date of that statement can't be before the start date. Clicking auto-reconcile will remove the mistake, but you still may need to adjust the dates manually. Set All Cleared Transactions to Reconciled - Cleared transactions are ones that you have downloaded or imported from a financial institution and are most likely ones that match up to your statement. Use this command to quickly mark the transactions in the statement date range as reconciled. Set All Transactions in Statement to Reconciled - Any transactions in the statement date range will be marked as reconciled. Set All Transactions in Statement to Unreconciled - This unchecks all the transactions in the statement date range and can be helpful if you want to start over on a reconcile and check each transaction individually as you find them on the statement. Delete Statement - If you create a statement by accident, you can use this to delete the current one selected. Most of the time reconciling a statement is quick and easy, but there are times when it just isn't obvious why the bank statement and MoneyWell won't match. Here are some tips to help you figure out the problems. Slight differences in amounts can be hard to see. Make sure to look for flipped numbers in amounts and deposits that are supposed to be withdrawals or the reverse. The starting or ending dates are wrong. Check to make sure these match your statement. Do the same with the balances. All the transactions look correct, but the balance is off. If it's hard to see where the problem is, look to the running balance on the transaction rows. Check to see where that balance matches the one on your statement and when it differs. The point that they diverge should give you a clue as to what transaction is missing or wrong. The statement reconciles, but the running balance or account balance is wrong. In this case, you may have a problem in a previous statement or your initial balance transaction might be wrong. Switch to the Cash Flow view and make sure that your running balance matches what your bank shows it should be right from the start. If it's wrong, unlock your initial balance transaction and change the amount to match the end of day balance on that date. Also make sure the date is one day prior to the rest of your transactions so you can clearly see that it's an initial balance transaction.